John Sprat was an Irish Carmelite that was known for both his abilities as a preacher and dedicated work with the destitute in the city of Dublin. While visiting Rome, his fame had apparently preceded him, and he became hot on the Jesuit circuit, giving sermons and receiving tokens of esteem from his peers. One of the more impressive tokens he was gifted was the remains of Saint Valentine by Pope Gregory XVI, which had recently been uncovered during grave restorations. Sprat brought the Reliquary containing the relics to his Whitefriar Street Church in Dublin, where they remained popular until the death of their popular procurer. With the death of Sprat, the relics went into storage and were not venerated until the church went through restorations in the 1950’s/1960’s. Both an altar and shrine were created and are now watched over by a statue depicting the saint holding a crocus (carved by Irene Broe). Today the shrine is popular with couples who come to pray for St. Valentine to watch over their lives together, and to celebrate the feast day of February 14th which includes the Blessings of the Rings for those about to marry. The reliquary is placed on the high altar and venerated at the Masses. 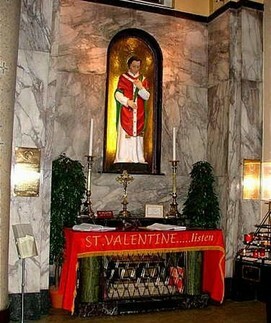 So what does this particular collection of St. Valentine relics contain? According to an inscription on a gold plate attached to the casket: This shrine contains the sacred body of Saint Valentines, the Martyr, together with a small vessel tinged with his blood. More specifically, the reliquary contains “some” of his remains (never claiming to have all of them), and a small vessel tinged with his blood. All of which is contained within a small wax-sealed box with a red silk ribbon around it. This box is located in the casket, which is occasionally opened to check on the contents. The smaller box remains sealed.